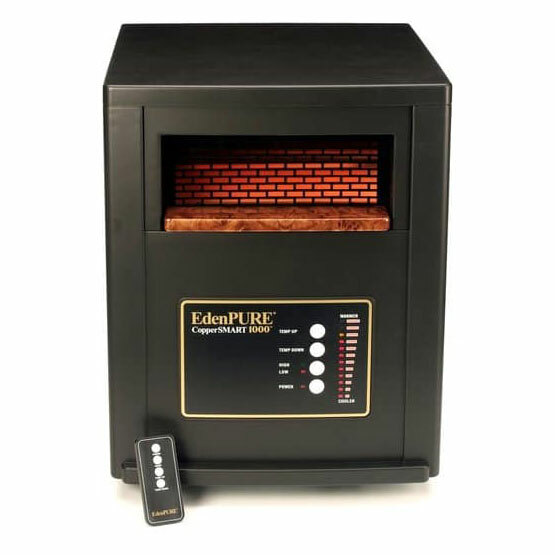 The EdenPURE® CopperSMART 1000 is a portable zone heater with a Copper PTC heating element at its core. The EdenPURE® CopperSMART 1000 is a portable zone heater with a Copper PTC (Positive Thermal Coefficient) heating element at its core. This supplemental heat source is designed as a reliable, durable and efficient means of heat production. The heater is safe, healthy, efficient, and unlike other heaters, it is safe to the touch on all exposed surfaces. With over 4.5 sq. feet of copper surface area, the The CopperSMART 1000 by EdenPURE’s durable Copper PTC heating element efficiently provides penetrating heat that will not dry out humidity or reduce oxygen. It has 24 heat settings that enable it to satisfy virtually any comfort level. This classic cabinet design also has “High” and “Low” modes to give it additional flexibility. This product is eligible for FREE SHIPPING except for deliveries in Alaska and Hawaii.